Every car has it's factory-recommended servicing schedule which should be followed to maintain your warranty and to keep the car running well. 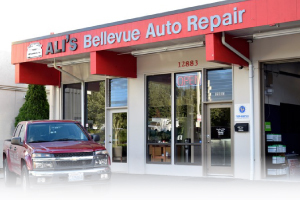 Ali's Bellevue Auto Repair is prepared to help maintain the warranty on ANY MAKE OR MODEL of car or truck. To be clear, you DO NOT have to go to the dealership to make sure your 30K, 60K, 90K (etc.) factory-recommended service is accomplished. We have all of the info on what your car needs at its current mileage, whether it's a Japanese, German, or American make. This regular auto maintenance should be continued even for cars no longer under warranty. This kind of service is also referred to as a "Car Tune-up" by some, but the recommended service may touch on more than spark plugs and oil changes---some examples are listed above. Another HUGE benefit of getting all of your servicing and repairs are done at only one place is that we can keep an accurate history for you. Not only can we keep your car under warranty, but we will have a better idea of what things to watch out for in future repair situations. We want to be your trusted car adviser! The ultimate goal is to reduce the number of repair needs over time and avoid any disastrous failures. At the higher mileages, servicing generally needs to be done every 30K miles. Ali's Bellevue Auto Repair is here to answer all of your questions. Let's get your car maintained properly. Call today!